Protecting your teeth from damage is the best way to keep your smile healthy for a lifetime. While many people think of good preventive oral health as brushing, flossing, and visiting a dentist, there are other potential problems that can threaten the health of teeth beyond decay and gum disease. For some patients, ensuring good oral health involves the use of mouth guards and other dental appliances. At Plano Smiles, we help patients enjoy strong and healthy smiles with custom mouth guards in Plano, TX. 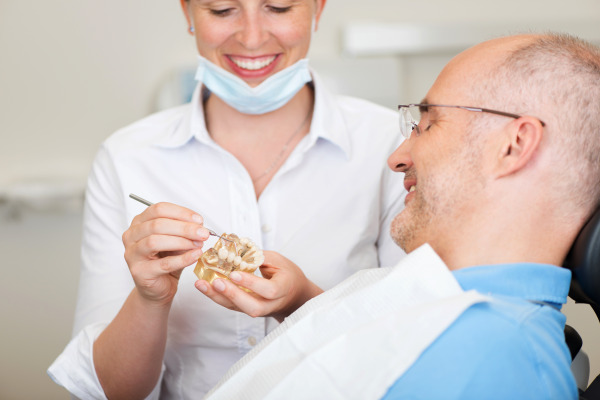 When Do I Need a Dental Appliance? Without the protection of dental appliances, patients who need these devices will notice significant wear and tear on teeth, experience head, neck, and jaw pain, or suffer from overall health issues due to lack of quality sleep. Dr. Yeary recommends mouth guards to help patients enjoy renewed wellness and prevent the need for dental restorations later in life. Oral appliances can help patients overcome the uncomfortable symptoms of sleep disordered breathing. Conditions like sleep apnea can be effectively treated with oral appliance therapy form our Plano, TX dental office. Patients with sleep apnea stop and start breathing multiple times throughout the night due to airway obstruction. As a result, sleep apnea sufferers struggle to get a restful night’s sleep and often feel fatigued and unable to focus throughout the day. If you have been diagnosed with sleep apnea, and are looking for a better way to treat your condition, Plano Smiles offers oral appliances in lieu of bulky CPAP machines. Snoreguards and sleep apnea oral appliances hold your jaw in the right position to prevent the blockage of air ways and facilitate easy breathing. These oral appliances are easy to wear, travel with, and get used to while sleeping – no face masks or forced air involved. Dental patients who participate in sports are more likely to experience dental emergencies. Athletic mouth guards are an important part of making sure that you are safe and protected while playing high impact sports like football, hockey, basketball, and baseball – where high-speed objects and bodily impact may damage or knock-out teeth. Dr. Yeary creates customized athletic mouth guards to ensure that your smile is well cared for while you are out on the field or court. Our personalized oral appliances are made to feel comfortable and provide adequate protection and avoid injury to teeth. We’re committed to protecting your smile and your overall wellness, which is why we create custom oral appliances to fit your unique needs. Whether you’re a night time teeth grinder, you experience sleep disordered breathing, or you want to prevent dental emergencies, mouthguards from our Plano dentist can help. Contact Plano Smiles for your consultation today.